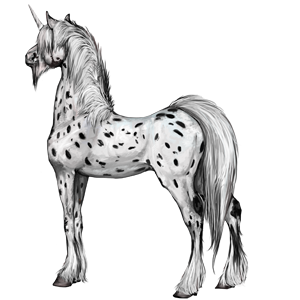 The unicorn is an equine animal with a horn on its forehead. This horn gives them a dressage bonus. To be able to cover a unicorn, both parents must be unicorns of the same breed and you must have a unicorn covering session available. If you follow all of these rules, you have a one in 5 chance of getting a unicorn. Once you cover a unicorn mare, both the mare and the potential unicorn filly will need 10 real hours before they can be covered. Diligenceღ is not registered in an equestrian centre yet.